May 24th marked the culmination of AlphaGraphics’ “agTwister: Connect the Dots to Win the Multi-Channel Marketing Game” self-promotion campaign with a lunchtime marketing event that drew more than 40 high-value customers and shone a spotlight on three in particular who served as guest panelists. The trifecta of customers—Drew Chelosky, Director of Development at University of Pittsburgh School of Law; Brad Wucher, Group Creative Director at Brown Mackie College and Argosy University; and James Malezi, Director of Annual Campaigns and Special Gifts at University of Pittsburgh/UPMC—agreed to share their multi-channel marketing success stories. Each described the challenges they faced in their departments or organizations, the options they had for addressing those challenges, the innovative approaches they took with the help and expertise of our marketing strategists and designers, and the impactful results of their efforts. The self-promotion as a whole educated our customers on the four “must-haves” of multi-channel marketing—target, engage, integrate, measure—and the marketing event leveraged the power of first-person customer testimony to demonstrate proven success. Connect the Dots: Helping your team win the multi-channel marketing game. 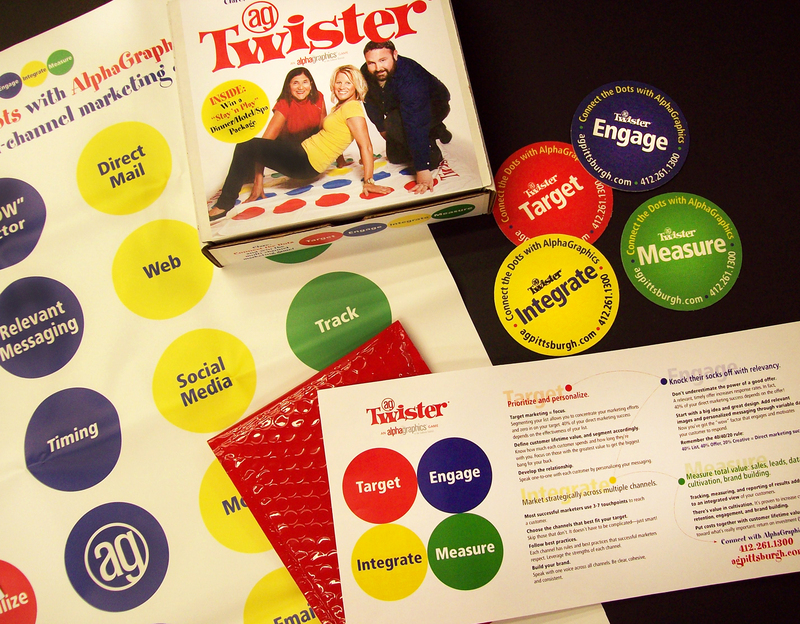 In April, AlphaGraphics in the Cultural District launched our “Connect the Dots” self-promotion campaign with the mailing of agTwister, a play on the classic game of Twister, with our own AlphaGraphics twist! Many of our clients jumped in, gave the spinner a whirl, and joined us in our multi-channel marketing game. They visited their personalized URLs and gave us some great feedback on their own marketing efforts. May has arrived, and the game continues. On the heels of the boxed game, we mailed a brochure that describes just what we mean when we say, “the multi-channel marketing game.” To our clients who responded to the first mailing, we threw in a little something extra—a set of four agTwister coasters (handy for agTwister parties, of course). Our “Connect the Dots” message is simple. For marketing success, you’ve got to put into play four must-haves: Target, Engage, Integrate, and Measure. It breaks down as follows…..
TARGET – Prioritize and personalize. • Target marketing = focus. Segmenting your list allows you to concentrate your marketing efforts and zero in on your target. 40% of your direct marketing success depends on the effectiveness of your list. • Define customer lifetime value, and segment accordingly. Know how much each customer spends and how long they’re with you. Focus on those with the greatest value to get the biggest bang for your buck. • Develop the relationship. Speak one-to-one with each customer by personalizing your messaging. ENGAGE – Knock their socks off with relevancy. • Don’t underestimate the power of a good offer. A relevant, timely offer increases response rates. In fact, 40% of your direct marketing success depends on the offer! • Start with a big idea and great design. Add relevant images and personalized messaging through variable data. Now you’ve got the “wow” factor that engages and motivates your customer to respond. • Remember the 40/40/20 rule: 40% List, 40% Offer, 20% Creative = Direct marketing success! INTEGRATE – Market strategically across multiple channels. • Most successful marketers use 3-7 touchpoints to reach a customer. • Choose the channels that best fit your target. Skip those that don’t. It doesn’t have to be complicated—just smart! • Follow best practices. Each channel has rules and best practices that successful marketers respect. Leverage the strengths of each channel. • Build your brand. Speak with one voice across all channels. Be clear, cohesive, and consistent. MEASURE – Measure total value: sales, leads, data, cultivation, brand building. • Tracking, measuring, and reporting of results adds up to an integrated view of your customers. • There’s value in cultivation. It’s proven to increase customer retention, engagement, and brand building. As some of you know, we are in the midst of our annual spring marketing campaign. Every year, we try to break the mold of typical business communication. Building on our mission of providing innovative multi-channel solutions that drive measurable results, we have asked some of our client base and other contacts to join us for a game of AG Twister. Using a “Connect the Dots” theme, our team developed a multi-channel process to help our clients and prospects see how AlphaGraphics in the Cultural District can help streamline marketing strategy. Using print (a super-fun Twister board and spinner), web, and e-mail, our team highlighted simple ways to overcome typical marketing challenges and obstacles such as real-time reporting, list procurement, relevant messaging, and media integration. The campaign aims at providing the end user a roadmap on how to cross the multi-channel bridge and the potential communication gap that goes with it. Check out our webpage for more info and YOUR chance to get in the multi-channel marketing game. Here at AlphaGraphics in the Cultural District, we see scores of client marketing materials come through our center. We invite you to take a look at our case studies and see how using multiple touches such as such as e-blasts, PURLs, print collateral, and text messaging can attract attention, increase response rates and deliver measurable results. in a month-long exercise called “Thing-A-Day”. Everyone is encouraged to select a monthly, weekly, or daily challenge. You can use any medium (drawing, painting, photography, videography, writing, cooking, sewing, building, installing, inventing, etc.) Time spent should be about 30 minutes. 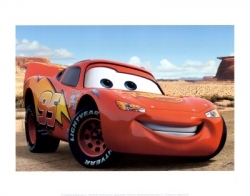 Report back to the blog once daily to post your “thing”. Thing-a-day.com was first launched as a monthly effort to create a community of participants signed up for the challenge of creating a thing a day and sharing it with the others who had accepted that same challenge. This concept was born from the work of Ze Frank, who spent a year posting a daily new piece of original content on his personal website http://www.zefrank.com. One of the re-creators of thing-a-day as we know it today, participated in Ze Frank’s daily challenge and thought it was so inspirational, that it should be opened up to a larger community format. An open invitation in 2007 brought together over a hundred people to sign up for the first Create-a-thing-a-day. After 28 days, over 1200 individual posts were created, each one containing an original drawing, writing sample, photo, etc. reported by their creators. By mid afternoon on the last day of February Thing-A-Day 2012 had 189 contributors from around the world, 2,418 posts, 1,721 tags, and 2,813 comments. I made my last post late last night. It has been a great experience exercising my creativity in different ways outside of the workplace and being able to share it with an online community. I will admit: some days were tougher than others — “what will I create for today’s thing?” stirring in the back of my mind as I traveled home from work. Reading other thing-a-day bloggers posts was always motivating and inspiring for those days when I felt like my brain was filled with tumbleweeds! I hope to carry on and continue this exercise not only in February, but throughout the year! If you should want to sign up for Thing-a-day 2013 check back at the end of January for registration. The AlphaGraphics team is proud to share the news that we have received two very prestigious awards: the NAPL Management Plus Silver Award, from the National Association for Printing Leadership, a leading management education and industry research organization; and the PODi Best Practices Award for Self Promotion, from PODi, a global organization for the advancement of direct marketing driven by digital print. The NAPL Management Plus awards are unique in that they recognize overall achievement across many disciplines. Entrants are judged on performance against industry standards in seven key management areas: Leadership and governance, human resources, strategic planning, marketing and sales, operations, community/industry relations, and financial performance. The 2012 NAPL Management Plus Silver Award will be presented at the Vision 3 Summit, February 19-22, 2012, in Marco Island, Florida. Our case study on our popular “Use Your Coconut” multi-channel campaign earned the 2012 PODi Best Practices Award. These awards recognize innovation, technical expertise, and the delivery of excellent, measurable results in direct marketing from around the world. Our “Use Your Coconut” campaign used outside-of-the-box thinking that raised the bar for what can be accomplished using dimensional mail, then strategically employed ten marketing channels with appropriate imagery and messaging to drive results. The case study was presented at the 10th annual PODi AppForum conference, January 23-25, 2012, in Las Vegas. It has also been added to PODi’s Digital Print Case Study Database, the largest collection of digital print case studies and only compilation of its kind for the digital print marketplace. To download our case study, select AlphaGraphics Integrated Direct Mail Campaign – Use Your Coconut on the AG website.